Have no fear, Doc Savage is here! The intrepid Doc Savage (Ron Ely) and his Fabulous Five journey to the wilds of South America to investigate Doc’s father’s death in the jungles of Hidalgo. En route, they encounter numerous dangers as the maniacal Captain Seas tries to thwart them as they come closer to discovering his vast treasure of stolen Incan gold. Doc Savage: The Man of Bronze is a delightful globe-trotting adventure film based on the popular 1930s pulp fiction character. It features some exotic locales, great set design, plenty of excitement, and loads of tongue-in-cheek humor…much in the vein of the original Batman television series. Savage is indeed a “man of bronze.” He’s an American who has Herculean strength, shiny white teeth, perfectly groomed hair, and impeccable manners. He also has the morals of a Boy Scout and would never hesitate to aid an old lady crossing the street. When asked what he would like to be served onboard Captain Seas’ yacht he responds, “A Coke, please”. His Fabulous Five are equally honorable and, like typical comic book characters, have a range of capabilities to help their leader in times of trouble. 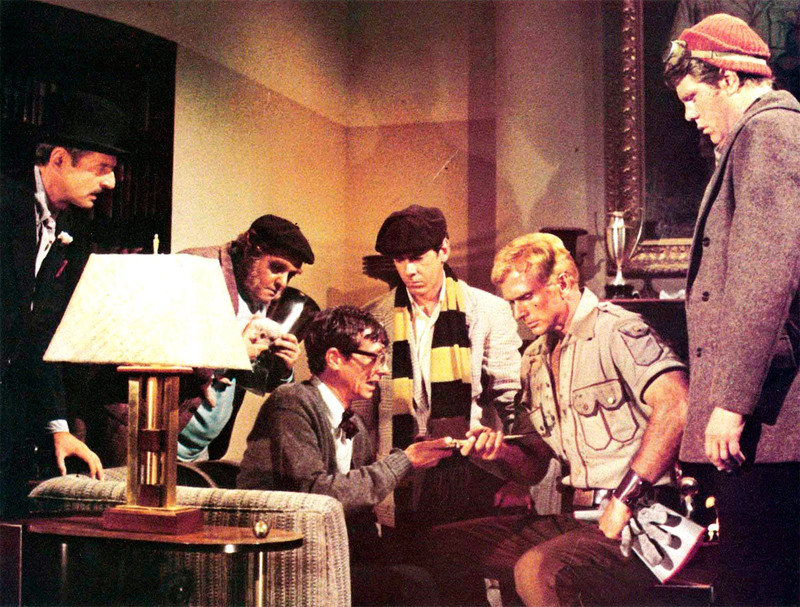 There is Monk, a chemist (Michael Miller); Major Roberts, an electrical wizard (Paul Gleason); Littlejohn, an archeologist (Eldon Quick), Ham, the “brains” (Darrell Zwerling), and Colonel Renny, a construction engineer aka “the strongman” (William Lucking). Like Doc, these men, devote their lives to traveling around the world for the sake of justice. Also in the cast are Pamela Hensley as Mona, a love interest for Doc, and Paul Wexler as the diabolical Captain Seas. The character of Dr. Clark Savage Jr. originally appeared in magazine format in 1933, written by Lester Dent under the pseudonym Kenneth Robeson. The series lasted for 181 issues and was brought to even greater fame in the 1960s when artist James Bama created new cover designs for the Bantam Books paperback re-issues. 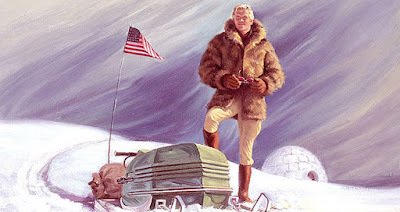 By the mid-1970s, over 20 million Doc Savage stories had been sold around the world. Hence, he was a fantastic character to bring to the silver screen. This idea was considered in 1966 after the James Bond films proved to be such box-office attractions. Chuck Connors was to star in the filming of the 1934 story “The Thousand-Headed Man”, but the securing of the film rights failed and it was shelved. It was not until 1974 that producer George Pal decided to make a Doc Savage film and obtained both film and television rights with the plans of creating a televised adventure series after the picture was released. Pal originally hoped to cast Hercules-legend Steve Reeves as Savage. But he changed his mind eventually and selected Ron Ely (Tarzan) for the part instead, dying the man’s hair blonde for the role. He was an excellent Doc, exuding charm and uttering his campy lines with dead seriousness. However, in spite of all its merits, the film bombed at the box-office. The timing of its release was just a matter of ill fortune. This was the mid-1970s and not many people wanted to watch a 1930s-themed adventure film with such goody-two-shoes humor. By the late 1970s, the mood had changed and the similarly campy Wonder Woman did very well on television. Perhaps Doc Savage would have performed better if it was geared towards adults and made into a dramatic adventure flick instead. 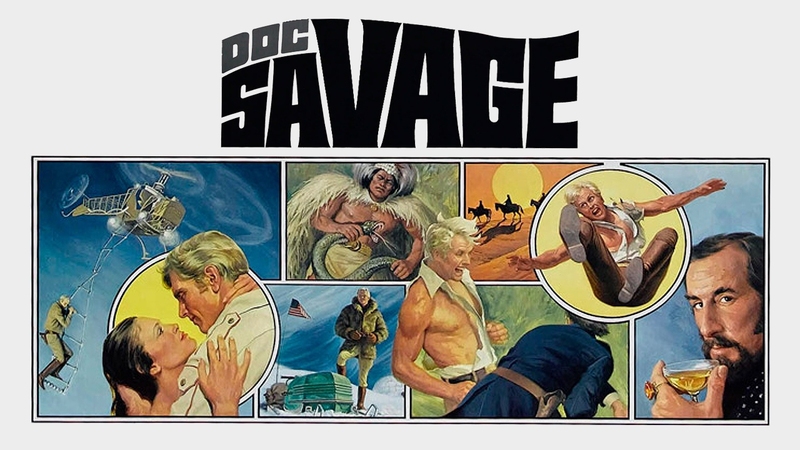 It truly is unfortunate that Doc Savage became such a loss for George Pal (it was the last film he produced) because, while it isn’t a comedic gem, it really is colorful and quite entertaining. So entertaining, that it is disappointing to learn that the sequel (promised at the end of the credit) was never put into production! It would have been great to see the follow-up. Sorry to burst your bubble, but…. We, my Dad wanted to see it, he had read the books and really wanted to see it. Perhaps we were jaded then, no, it really was too campy. The character exposition is fairly nonexistent. Which makes all of them seem two dimensional, with a totally silly ending. There was a very good reason it bombed at the box office, not due to social changes, it was just a really bad movie that insulted the intelligence of all who saw it. This should not have been Pal’s swansong. If you do get the chance to view his archives at UCLA take a good look at the film and television projects he’d truly wanted but for whatever reason didn’t or couldn’t. Some have since been done by others, and some still should be.